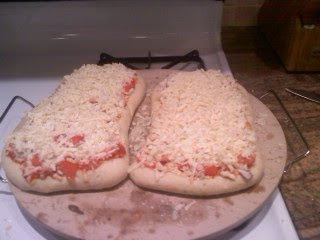 We decided to have a make your own pizza girls night. Any time I've made pizza before, I just bought some premade dough from the grocery, but this time I wanted to give it a go myself. Turned out it's really easy to make! The original recipe says you can let it rise for only 30 min, so you'd be able to eat in about an hour, but I let mine rise over an hour just because I had that much time before going over to Melissa's house. Turned out light and the bottom was nice and crisp. I actually made 2 doughs - a plain one and one with 1/2 tsp each of garlic powder and oregano. 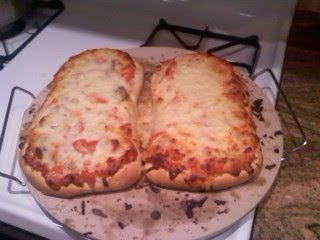 Once we covered the 2 half pizzas with some mushrooms, tomatoes, diced onions, and over a pound of cheese (seriously - 1 lb mozz and maybe a quarter cup of grated parm), you couldn't tell the difference in doughs. But I think the garlic/oregano one would be awesome on a white pizza or as breadsticks. In a small bowl, dissolve the dry yeast into the water, and sprinkle 1 tsp white sugar on top. Allow to sit for about 10 minutes, or until foamy. In a large bowl, combine the other tsp sugar, flour, salt, and olive oil. 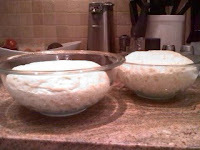 Pour in the yeast mixture and beat until a stiff dough has formed. I used my kitchen aid hand mixer with the dough attachments to make it super quick, then knead it 4 or 5 times until it was a soft, supple ball. Take it out of the bowl long enough to coat the bowl with cooking spray, then drop the ball back in and turn to coat with the oil. Cover with a kitchen towel and allow to rise for about an hour until doubled in size. Preheat oven to 400. If using a baking stone, put into oven to heat up for 15 min, too. 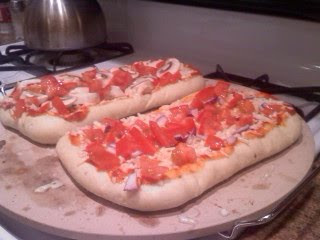 Roll out dough into pizza shape of your choice. (I did this on granite and it didn't actually stick, but if you have a stickier dough just lightly flour the surface first.) Sprinkle some cornmeal on the surface to coat the bottom of the rolled out dough. If using a cookie sheet, place on sheet. If using a baking stone, either use a pizza peel to slide the dough ontot it, or carefully take it out of oven and place the dough on it, then put back in. Don't burn yourself! 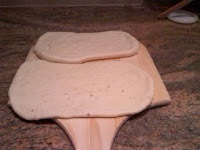 Make sure to kind of press little dents all over the dough so the middle doesn't rise so much. Prebake for about 10 min, then take out and top with your favorite toppings and continue to bake until cheese is bubbly and edges are golden, about 15-20 min.